Shame on me, going the hedonistic path and becoming a zoologist - I didn′t even try to apply. Adolf Hitler did - and was rejected. Egon Schiele did it the other way round: He intended to apply for the college of design (Kunstgewerbeschule), but was recommended for the Academy due to his obvious outstanding talent. One of the World′s most excellent academic institutions in fine arts, the "Akademie der Bildenden Künste" by the Ringstraße is housed in a rather unassuming building designed by the prolific Danish architect Theophil Hansen, who was also responsible for the design of the Houses of Parliament. Most of the touristy attention goes to the Secession Building just behind the Academy, which is understandable - both architecture and exhibition of the Secession are more appealing than the neo-Renaissance façade or the badly advertised study collection of the Academy. However, beyond silent admiration that you should show when standing in front of the Academy, there are several pieces of art in the exhibition that do justify a visit. 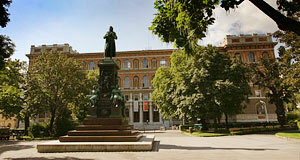 The Academy was founded as early as 1692, but the current building was erected in the course of the Ringstraßen-re-vamping campaign of Emperor Franz Joseph I in 19th century; opened in 1876, to be precise. Enter the surprisingly shabby entrance hall and look for a sign indicating the "Gemäldegalerie" ("Painting Gallery"), which will take you straight to the study collection. The galleries of the Academy are partly in shockingly bad shape - given the tradition of this institution and the vicinity to the Kunsthistorisches Museum with its state-of-the-art arrangements. The Academy′s collection aims to display representative pieces from significant developments and schools in the history of art, mostly for educational purposes for the sake of its own students - although the collection, not the training, focuses on pre-1800, European painting. The most significant pieces of the collection are Renaissance paintings by Hieronymus Bosch and Lukas Cranach the Elder as well as Baroque art by Flemish and Dutch painters. The appeal of the Academy is the much more personal feel that you can get here compared to the incredibly large and popular (ie crowded) Kunsthistorisches Museum, best experienced in combination with a guided tour. The first time I took a tour was when I was 14 - bad mistake. Wait at least until you are 18. Otherwise you might fail to fully appreciate Bosch′s "Das Jüngste Gericht" ("The Last Judgement"), something like a party with Franz Kafka, Quentin Tarantino and Lou Reed on LSD, painted around 1500. Other masterpieces include works by de Hooch, Vermeer, Van Dyck and Rubens. Some tranquil moments might be welcome before you dive into the business of the Karlsplatz with its druggies, heavy traffic and crowds of tourists. Other arty attractions nearby ensure that this part of Vienna is a hot-spot of museums: Apart from the previously mentioned Secession you find the Albertina with one of the World′s largest collections of graphics, the Kunsthistorische Museum, the new Museumsquartier and - with a sportive spirit - the Museum for Applied Arts (MAK) as well as the Belvedere Palace and Austrian Gallery within a walking distance of the Academy.